Add cheesy flavor to these meatballs with parmesan cheese, and bake to seal the deal. 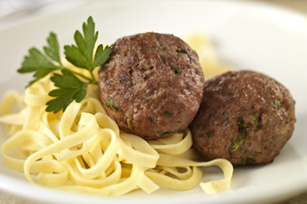 These meatballs are so good, you'll be sure to wow the family! Mix ingredients just until blended; shape into 12 meatballs. Place on foil-covered rimmed baking sheet. Bake 25 min. or until done (160°F). Try serving with your favorite hot cooked pasta and sauce, and a quick bagged salad tossed with your favorite KRAFT Dressing, such as House Italian. Substitute 1 Tbsp. parsley flakes for the chopped fresh parsley.